A party from Maybole Town Twinning travelled to Crosne to celebrate the 25th anniversary of the signing of twinning and the Carnival over the last weekend in May. Michel Berson was the Mayor of Crosne in 1982 at the time of the signing. David Kiltie, chairman of Maybole Community Council signed the agreement on behalf of Maybole. See full story below. 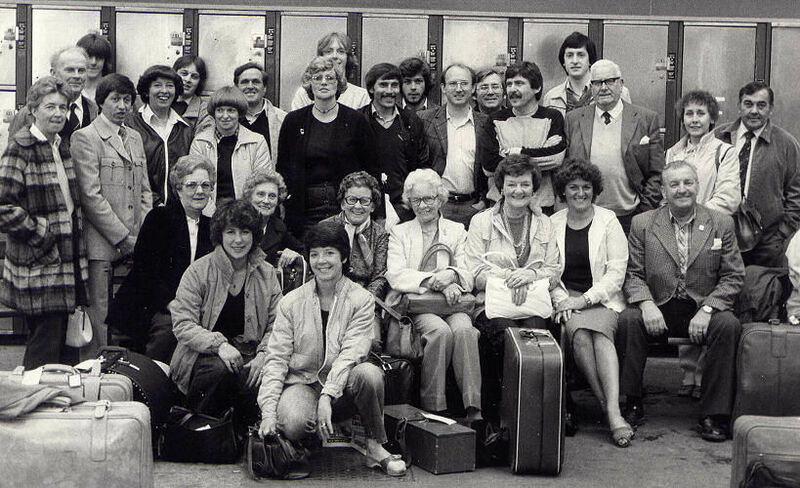 Twinners who travelled to Crosne in 1982 for the official signing of the twinning agreement. William Grant, (left) chair of Maybole Town Twinning Association, and Alain Girard, Mayor of Crosne. Michel Berson, former Mayor of Crosne, Hans Otto Zimmermann, former Burgermeister of Schotten, Marylene Laug, deputy Mayor of Crosne, William Grant, and Daniel Robin, chair of Crosne Town Twinning committee. Celebration on Friday evening in Crosne to mark the 25th anniversary of the official twinning agreement between the French town and Maybole. 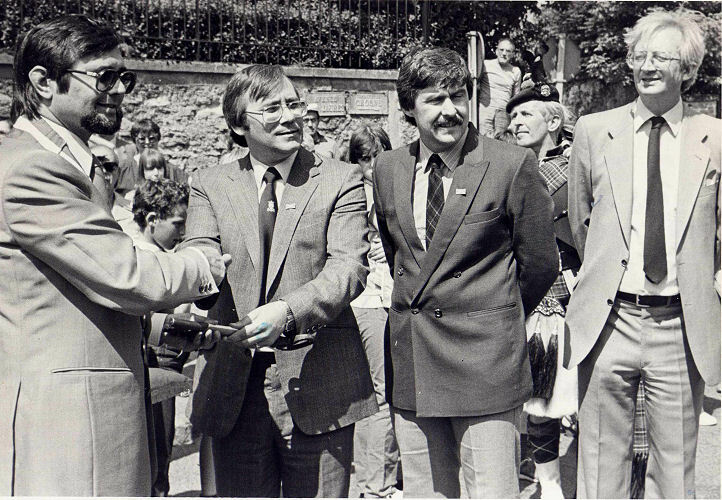 Michel Berson, Mayor of Crosne, presents the key to the French town to David Kiltie Chairman of Maybole Community Council and Alan Murray, Chairman of Maybole Town Twinning Association (first 3 on left). May - 2007. Maybole – Crosne 25th Anniversary. A party from Maybole Town Twinning travelled to Crosne to celebrate the 25th anniversary of the signing of twinning and the Carnival. They were also joined by twinners from Schotten, Germany; Beloeil, Belgium; Arco, Italy; Bogen, Germany and Rymarov, Czech Republic. Celebrations began on the Friday evening with the official ceremony of the 25th anniversary of twinning. The festivities began with a parade from Rue de Maybole to Espace Rene Fallet where the official part of the evening was held. Speeches on the history and future of the twinning link were made by Alain Gerard, Mayor of Crosne, Daniel Robin , President of Town Twinning Crosne, and William Grant – President of Town Twinning Maybole. Speeches of congratulations were made by the other assembled town twinners, before small gifts were exchanged. The young people of Bellevue College, who had visited Carrick Academy, Maybole in March this year, then gave an excellent rendition of songs of Robert Burns. This part of the evening then finished with the singing of the European anthem “Ode to Joy”. An excellent buffet and cutting of a cake was enjoyed by all. Saturday morning saw every body up early for a visit to Paris for a guided tour of the Museum Carnavalet, famous for its paintings of Paris throughout the ages. The afternoon was free time and then it was time to return to Crosne where the evening was spent with hosts before the torchlight procession through the town that started at 10pm. On Sunday morning there was a guided visit to the Park Caillebotte in the nearby town of Yerres, and, on return to Crosne, lunch alfresco was enjoyed in the garden of the Deputy Mayor Marylene Laug. The Carnival took place in the afternoon with masses of people taking part; the theme for this year was “The Cinema”. In the evening the group was treated to a giant BBQ before attending an open air concert which climaxed in a magnificent fireworks display at midnight. The return leg of the celebrations will take place in Maybole over the weekend 28 – 30 September 2007. If you would like to be involved and could host up to 2 people please contact William Grant on 01655883312. The speech of William J Grant, Chairman of Maybole Town Twinning. It is amazing to think that we are celebrating 25 years since we first signed our twinning agreement with Crosne away back in 1982. Twinning towns is a wonderful way of bonding communities in long-term friendships. It also helps to foster understanding and tolerance by giving people from twin towns the chance to learn about another culture, language, history and way of life. This is especially important for young people who may not have had a chance to leave their home town. For them, the twinning relationship offers an opportunity to broaden horizons as well as nurture important qualities such as openness and acceptance. It is indeed excellent that in the last 2 years we have managed to arrange school exchanges between Crosne and Maybole and we hope these will continue, building on the friendship that has been created between the schools. Twinning can fulfill several of the most human needs, companionship, activity, adventure, curiosity. It is a means of understanding other peoples, their culture, lifestyle, food, language. You make new friends, sometimes for life, and are accepted into families. Twinning began in the late 1940s as a means of reconciling European nations that had been torn apart by war. Historians often cite the twinning of Orléans (France) and Dundee (Scotland) in 1946 as the first modern twinning arrangement. As the benefits of the movement became apparent, twinning became a world-wide phenomenon. As it was set out to do, town twinning in forging partnerships, and continues to make an important contribution to this dynamic process of bringing European people together. It has helped to change Europe forever, gone are the days of dictatorships, East and west, today in this the 21st century , we live in a Europe where the concept “Liberty, Equality, Fraternity” flourishes, we live in ‘a peoples Europe’. The very best way of building trust, understanding and friendship between people in Europe is by meeting together, sharing experiences and learning from each other. Maybole Town Twinning Association is proud of its history in twinning, we are proud that our twinning has always been and hopefully will continue to be a peoples twinning, built on the friendship of individuals but most importantly the family. Through this twinning of the people we the citizens of Maybole and Crosne, and of course our fellow twinners from Beloeil, Schotten , Arco, Bogen, Ozimek and Rymarov have in our own way helped to break down the barriers of language, race and creed, but in doing this we have not forgotten our own individuality. We are part of a Europe in which we can exchange opinions and enjoy joint activities between our twinning family. The arranging of twinning events through all these years of course takes a lot of hard work and we thank all those who have giving of their time freely, working for the twinning between Maybole and Crosne, making all the events over the years so successful. At this tine we remember our fellow twinners who sadly are no longer with us. Let us look forward to the next 25 years.